In order to properly build a house, at one time people learned how to use appliances that were based on the attraction of the earth. So, with the help of a plumb you can always check the vertical position of any surface, and, of course, the walls of the building. The design of the water level is very simple. In essence, these are 2 vessels connected to each other by a tube. It is enough for two people to take the vessel, disperse to the required distance and check the horizontal surface or tighten the cord along which the building material will be laid or the tile is laid. In this way, very accurate results are achieved, which is proved by the houses built with their help. In this article we will not talk about these devices. They are already somewhat outdated. If you use them, the result may be inaccurate or there will be some inconvenience. So, the plumb will not work in windy weather, and the water level may freeze. In modern construction uses high-precision semiconductor equipment, the cost and functionality of which may differ. 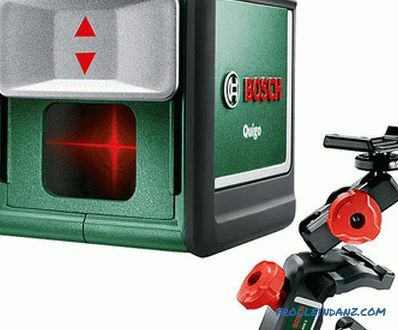 Depending on what kind of work will be performed, it is necessary to find out which laser level to choose, because not only the accuracy of the work, but also the mood of the device owner depends on it. 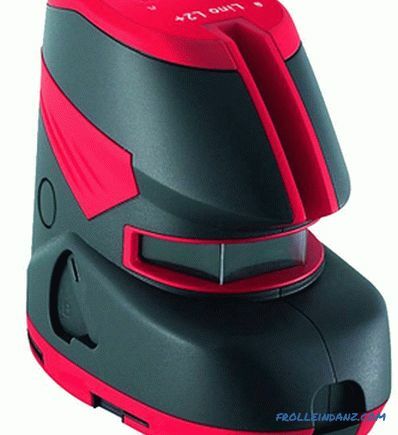 So, having discussed the advantages of using a laser level, let's take a closer look at this device. The beam of light emitted by the LED, thanks to an optical system consisting of specially made for this purpose lenses, comes out in the form of a thin luminous flux, focusing at one point. Thanks to such a device, a beam of light can be clearly seen at a very decent distance, up to several tens of meters. 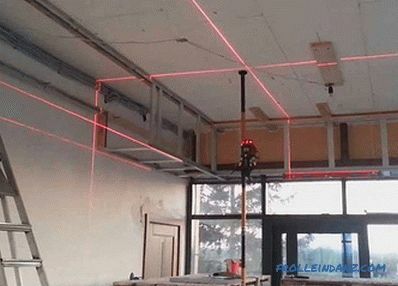 Some models of laser levels can be equipped with prisms, thanks to which the luminous flux turns into a line clearly visible on a wall, ceiling or other plane. Laser devices have their advantages, because they have a built-in self-leveling function (pendulum or electronic), allowing to achieve excellent results with a deviation of no more than 0.3‒0.5 °. There are models that need to be manually adjusted, for which a bubble level is built into them. Measurements are performed with very high accuracy - the error at a distance of 1 m is measured in tenths of a millimeter. A dot or line is clearly visible. On the wall, you can not draw the label, and immediately get down to work. Long preparation is not required to perform measurements. The work can be started immediately, taking the device out of the case. No special skills are required to work with simple instruments. All measurements can be done alone. consist of? 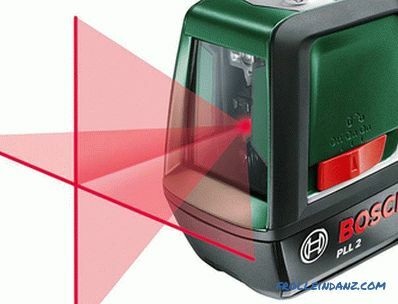 When determining which laser level is better, several interconnected systems should be distinguished. Brightness of a glow is provided by powerful LEDs. The choice is stopped at this light source due to their low energy consumption. In addition, the level of efficiency of the LEDs is very high, which means that they almost do not heat up. Under the action of an electric The field generated light of the desired wavelength (monochromatic). Basically it is red, less green. The luminescence color is not critical, but green and red are best seen even at a distance of up to 40 m.
Another distinctive feature of using light sources is that they do not have a filament, so even when the device is dropped is damaged. In addition, the radiation intensity with time almost does not change. The LED itself gives out scattered light, therefore, to focus it, an optical system is assembled from the lens system, thanks to which the output is a laser beam whose thickness remains almost unchanged even at a distance of 100 m.
Cheaper instruments use low quality optics, which can have a significant effect on the accuracy of measurements. In addition to the optical system, the levels are equipped with prisms that scatter the beam at an angle, so that we can see it on the surface as a bright line. In some devices, the head, rotating around its axis, "draws" a line along all the walls. 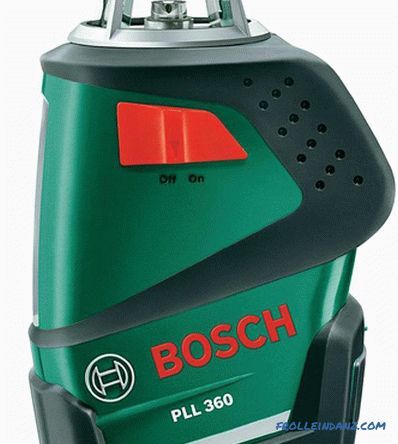 Due to the very high speed of rotation, reaching up to 600 rpm. the line seems continuous. In the construction of most models, the principle of a pendulum is used to maintain balance, the operation of which is provided by a freely fixed plumb. While the device is on a flat surface, there is no need for adjustment, but in the case of even a slight deviation, the plumb head, interacting with the magnetic field surrounding it, begins to generate a pulse, the power of which increases with increasing angle of the device. The control system receives a pulse and adjusts the position of the emitter with optics, with the result that the beam is installed in a horizontal position. The speed and the limit of operation depend not only on what company manufactured the device, but also on its accuracy class. It is quite clear that from cheap models there is nothing to hope to get ultra-precise results, but, as a rule, this is not required for the household level. As regards professional control systems, they are triggered when the beam deviates by tenths of a degree when the distance from the device is 1 m, and when it is 10 m away, the deviation does not exceed 1.5 mm. Automatic equipment works at an inclination of the device from 3 to 50 °. In the case when the device is outside the zone of maximum permissible values, the warning system is triggered - a sound or light alarm. In this case, human intervention is required to adjust the position of the device and its additional adjustment. In more expensive models, the system is controlled by a servo, the signal to which comes from a gyroscope. This technique is not only more accurate, but also more complex, so an unprepared person will not be able to work with it. The response rate is a fraction of a second. Some kinds of professional devices are difficult to use, but with control of most of the devices, in the control panel of which there are only a few buttons, an untrained person can handle it. 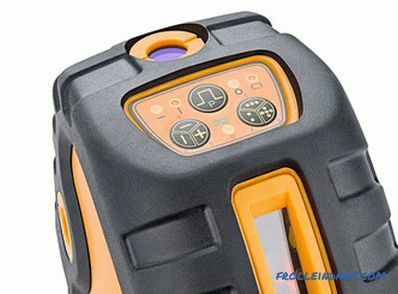 If the device has a rangefinder function, then in addition to the buttons on the case there will be a display on which accurate distance data will be displayed. Many devices have a button that disables automatic horizon adjustment. 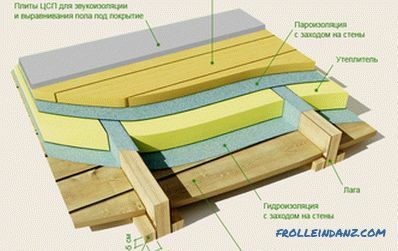 This function is provided in case the device will be used in the construction of inclined lines. In some models, to perform such work, it is not necessary to disable leveling. Professional and some other models of high-quality devices operate on batteries, which will last for 8-10 hours with active use of the device. Charging is made from a network of 220 volts. In cheaper models designed for domestic use, batteries are used as power. The target is used to mark the suspended ceiling, to level the floor, when installing sewers, storm drains, and other similar operations. Having set the target in the right place, a laser-level beam is directed at it. Using the markup of the target, it is not difficult to set the desired slope! 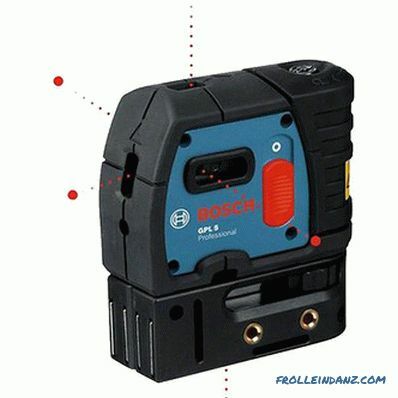 Using a laser receiver (for example, Bosch LR 1), you can increase the range of the laser level up to 200 m. You can work with it both indoors and outdoors . Axis builders or as also called "point lasers". To figure out how to choose a level, let's look at the description of each of them in more detail. 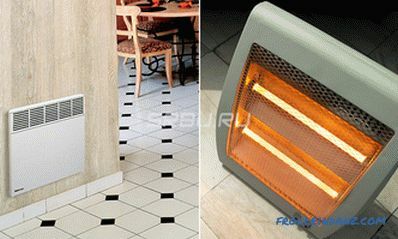 These devices belong to the class of static builders, because their design does not provide a rotating radiator. In addition, the laser is not displayed as a line — only a point indicating the direction is projected onto the surface. In this case, this is not a disadvantage, because that is how it is conceived. The device is used in large premises, such as production halls, office premises, or trading rooms, because the range of the concentrated beam is somewhat higher than that scattered as a line. One of its advantages is that the unscattered beam is clearly visible even in sunny weather. additionally, targets and signal receivers can be used. when transferring the markup from the floor to the ceiling. Devices with up and down directed beams are often referred to as laser plummets, which is not entirely accurate, as this is just one of the available functions. For example, putting the device on the floor, we get only the zenith, but lifting the device on a tripod and get nadir, which will help move the markup to the ceiling. There are devices with a front ejected and a raised emitter, so you will not need to use a special tripod to work with it. Of the simpler models, laser levels can be noted, in which the bubble rack is complemented by laser emitters. Such a device allows you to visually lengthen the measurement line. In the same category are the builders of point angles. You can also purchase and combined instruments, such as "crossliner * point builder." What can be very convenient when performing certain works. 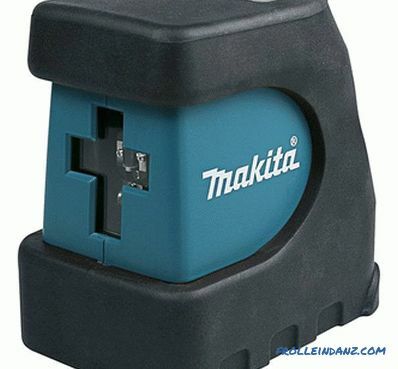 Devices of this type, as a rule, are used for marking inside premises when performing finishing and repair work. 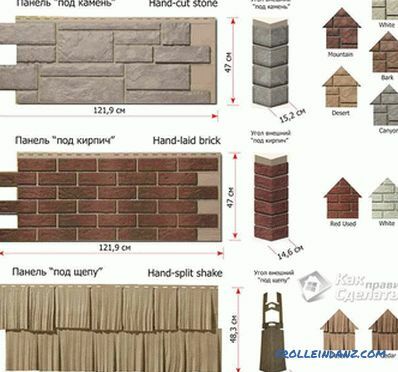 Sometimes they are used to mark the facade or when leveling small areas. Static line builders, as opposed to rotary builders, produce statically directed lines. Since there are no rotating parts in the device, the lines are obtained by splitting the laser beam with the help of special optical prisms. Because of this transformation, the beam is visible at a short distance - 20, less often 40 m.
If there is a receiver (not all devices have the ability to use it), the radius of the marking can be extended to 100 m. that devices have different characteristics, the functional features of the device need to know before it is purchased. There are so-called "multi-prismatic" devices in which there can be several prisms, diodes, rays. Previously, there were models that gave one line. Modern simple devices show a "laser cross" (2 lines intersect at right angles). Advanced static builders are able to display multiple lines and crosses. In addition, they have the function of a plumb, emitting a point laser up or down. When choosing an instrument, attention should be paid to the angle at which the rays are scanned. An indicator that is within 120 ° is acceptable. In more advanced versions of static builders, this figure can reach 160 ° and even more. It is good if the device has a function for obtaining additional intersections of lines (crosses). This will connect several horizontal and vertical lines into a full plane, covering 360 °. To work in the economy mode in the device you can turn off some lines (except for a plumb beam, directed downwards) that are not needed for a particular job. On the positive side, it should be noted that almost all modern static builders are equipped with a self-leveling system (pendulum or electronic). By placing the device on a more or less flat surface and having waited just a few seconds until it aligns itself, you can be sure that it is installed parallel to the horizon line. Even accidentally hooking the device, you can not worry, since the alignment process will happen again in automatic mode. Instruments of this type are used in determining the direction of the marking and to determine the difference in height between the points sought.Unlike the line builder, the laser level does not scatter the beam, but denotes a plane due to a head rotating around its axis, which has made it possible to achieve a decent range of the device. This feature allows you to successfully use the device not only in large areas filled with sunlight, but also indoors. In addition, you can change the speed of rotation of the working head in the range from 10 to 600 vol. / min This option not only helps to choose the right mode, but also saves battery power. Rotational plane builders are very expensive, so their use is considered the most appropriate when working with large objects and in the construction of supporting structures. This is due to the fact that the range of the laser is 50-70 m. If you use a receiver that catches the beam in the open area and signals this, then the distance of the device is increased to 300-400 m.
be equipped with a remote control with the same buttons as on the device body. In the device of rotary devices there is an "out of level" function, which will not allow making the wrong markup with a serious deviation from the norm exceeding 5-6 °. During storage or during transport, the self-leveling device must be turned off. 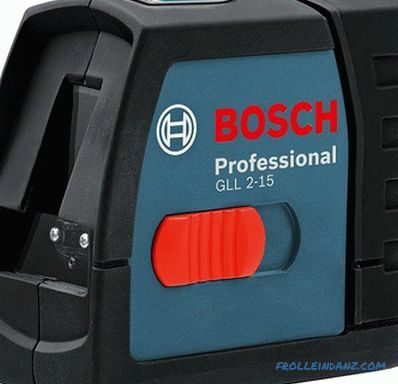 A lot of good laser devices can be found on the construction market, but some of them are in great demand because they have shown themselves from the best side. 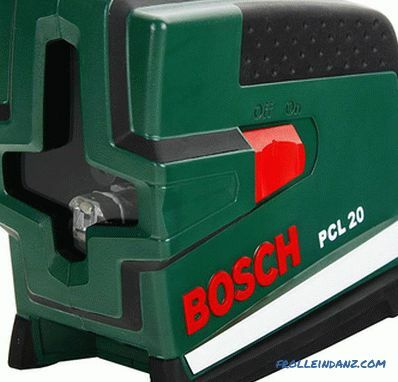 The table below provides specifications and a brief description of common Bosch models. 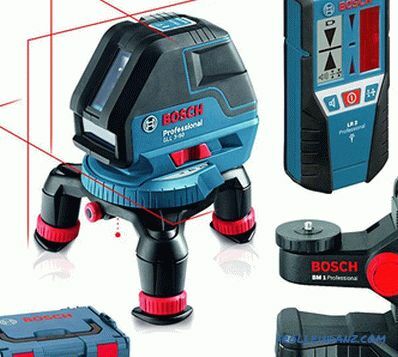 The range is up to 7 m.
The measurement accuracy is ± 0.5 mm / m.
When laying ceramic tiles, installing cladding and wall panels, or for repairing an apartment, this device is simply indispensable. It builds on the surface at once two planes with an angle of 90 ° at the intersection of the lines. The range is up to 10 m.
The measurement error is no more than 0.5 mm / m.
This advanced model of a cross double-beam laser level is equipped with a digital tilt indication. With this feature, it is convenient to create design projects and decorate the working surface of the wall. 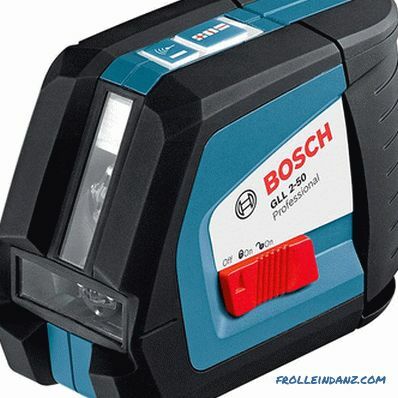 Range up to 10 m.
Accuracy: ± 0.5 mm / m.
In this multifunctional household plane builder, you can alternately or simultaneously turn on the laser beams. 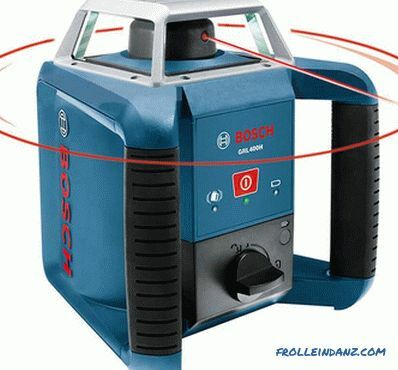 For convenient transfer of points from the ceiling to the floor, the device is equipped with two additional symmetric point lasers. Range up to 20 m.
Accuracy: ± 0.4 mm / m.
This is the only instrument with a prism that builds a horizontal plane 360 ​​° and a vertical 120 °. 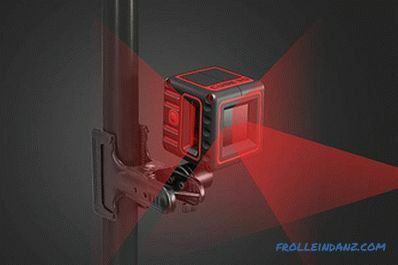 It can be equipped with a holder MM1 or a telescopic rod TP320. 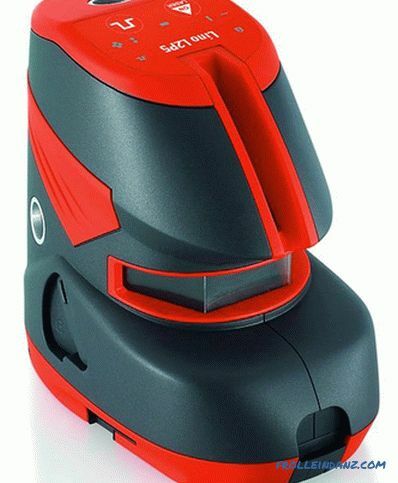 Range up to 15 m.
Accuracy: 0.3 mm / m.
This is a compact professional laser level with cross beams. It is equipped with a magnetic holder, thanks to which there are many options for mounting this device. 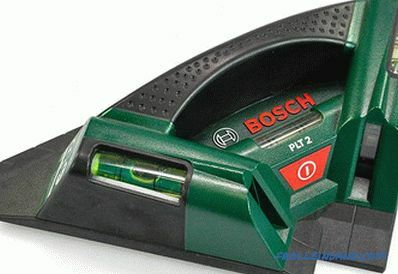 The range is up to 20 m.
Excellent accuracy: ± 0.3 mm / m.
Professional builder of laser planes of classical design. Equipped with auto leveling function. Leveling accuracy 0.3 mm / m.
Included with this multifunctional linear laser device is a mini tripod, thanks to which its field of application has been greatly expanded. There is a magnetic holder. Range up to 20 m or 80 m with receiver. Leveling accuracy ± 0.2 mm / m.
This device has the highest accuracy among professional devices.It simultaneously forms two planes (horizontal and vertical) 360 °. Accuracy is 0.2 mm / m in all planes. This device with the automatic alignment function simultaneously builds three rotational planes (two perpendicular vertical and one horizontal) 360 °. Complete with an industrial tripod BT 250 you can perform a large amount of work indoors at the right height. Accuracy of operation is not worse than 0.8‒1.0 mm per 1 m.
Being updated With the Quigo version of the world's most popular consumer laser in the world, the device in question has become more advanced. There is a function to disable the pendulum to build inclined planes. 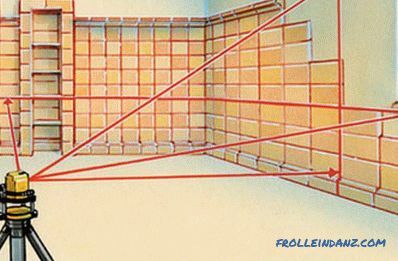 Accuracy of construction of projections ± 0.5 mm / m.
A simple and compact device that simultaneously forms a horizon and a vertical intersecting at a right angle. The sweep angle is 120 °. 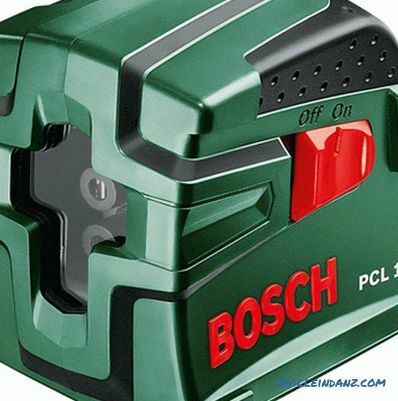 As for the drawbacks, there are practically no Bosch branded products. Marriage is extremely rare, the devices serve for a long time. 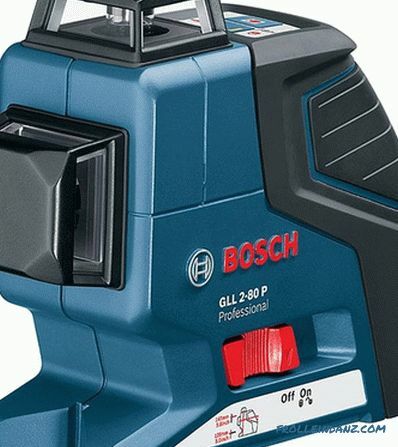 When acquiring a Bosch fake on the market, it is important to understand that apart from the logo and the appearance, there is nothing more to do with a well-known brand. This "product" warranty and service does not apply. You will get a fake at your own risk. It is also important to understand that the accuracy of measurements and other parameters of the purchased counterfeit device will be significantly reduced. The devices of this manufacturer are in considerable demand among professionals and owners of construction companies, as they have proven themselves from the best side. You can opt for a simple low-cost model or the level with a large number of functions. It all depends on the purpose for which this device is needed. The cost of the products of this company directly depends on the functionality of the device, you can not worry about the quality - all devices are reliable, very durable, and with proper operation and care will last a long time. 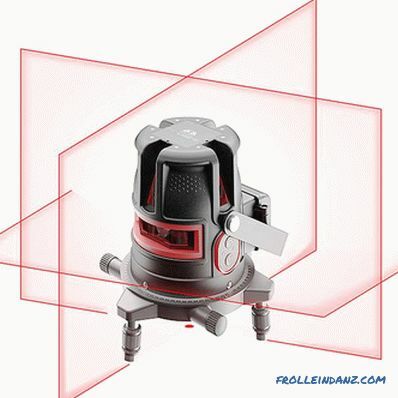 If the working conditions are extreme, then there are devices on sale equipped with special housings capable of protecting against damage, dust and water. The table provides an overview of some models. The allowable error is 0.2 mm / m.
Working range - 20 m or 40 m with receiver. The model used for industrial and professional use is equipped with a transformable stand-stand, which acts as an adapter for a standard stand, and many other options. With it, you can even fix the device on the wall. Permissible error of 0.2 mm / m.
The protection class is IP54. In this model, designed for both industrial and professional use, high-quality Leica optics are installed. This guarantees very bright and accurate projected lines. Acceptable tolerance ± 0.3 mm / m.
The working range is 15/30 m.
This model is also intended for industrial and professional use. The device builds not only lines, but also points (5 in different directions). Leica high-quality optics guarantee extremely bright and precise projection lines. The allowable error is 0.3 mm / m.
Operating range up to 20 m.
It uses Power Range Technology ™ technology. The device is able to build a horizontal plane at 360 ° and a vertical at 180 °. Such features will allow to use it with maximum efficiency. The advantage of any laser level from this manufacturer is that they do not need to be manually adjusted, or the process is so simple that any person can handle it. It is quite natural that you need to decide in advance for what purpose this device is needed and how it will be used. It is useful to know that, depending on the model chosen, the device can project at different levels and have different radii of action.To increase the range, receivers are used, which are not always included in the basic equipment of the device. If you need it at work, it is better to buy it immediately. It is better to clarify everything in advance by asking questions to the manager or consultant who is able to give a comprehensive answer. 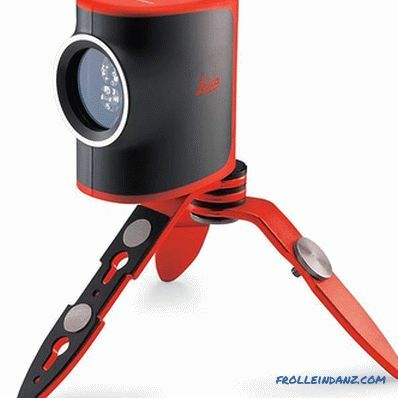 LEICA devices are notable for their high accuracy, so any model can be operated by a specialist as well as by any person who purchases a device for domestic use. Judging by the numerous reviews of people, the laser device LEICA will serve a long service to its owner and will justify the money spent on it. 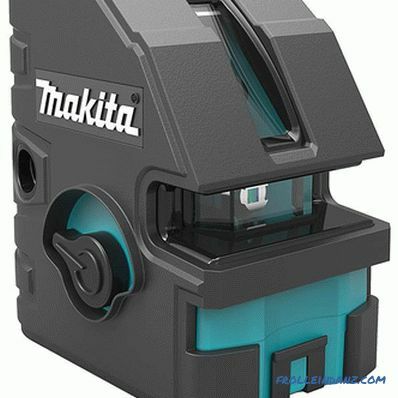 All Makita devices have an IP54 protection class and a rubberized case. Due to its reliability and accuracy, the device is in good demand. Measurement range with receiver: 100 m.
Accuracy: 0.1 mm / m.
The device can be operated at an ambient temperature of -10 to + 50 ° C. Included: remote control, target and glasses. The device is not easy, weighs 1.6 kg. Measuring range: 15 m. With receiver: 60 m.
The device can be operated at an ambient temperature of -10 to + 40 ° C. Included: case / case, battery, target. Instrument weight 0.47 kg. Measuring range: 15 m. With receiver: 30 m.
The device can be operated at an ambient temperature of -10 to + 40 ° C. Included: case / case, battery, target. The weight of the device is 0.475 kg. Just as in the previous cases, having familiarized yourself with the characteristics of the instrument, it is important to clearly define the type of instrument and its functionality. So, we have closely approached the question of choosing a suitable device and consider the criteria by which it should be evaluated. We will not say unequivocally that only eminent manufacturers produce quality products, but they provide a guarantee and ensure the fulfillment of warranty obligations. As a rule, their representative offices are in all major cities. If you decide to purchase the device of a little-known company, then ask where to turn in case of failure of the device. Very often, the phrase "Manufacturer Warranty" implies that in case of a breakdown, you will have to send the device to China at your own expense and expect a couple of months to return. You can send the same device (again at your expense), saying that the failure occurred due to the user's fault. Do not be surprised that German equipment made in China is sold in an official store. At first glance, the same picture is on the market, but there is a difference. To reduce the price of their products, many eminent manufacturers have adjusted its production in this country, since there is a cheaper labor and there are less taxes. But high-quality, branded equipment produced at the factory, in compliance with all standards, so it can be purchased without fear that it will quickly fail. Fakes are collected in underground workshops, often located in the basements of houses. In addition to external similarities with the original devices, they have nothing in common. If the device is needed for domestic use, then devices that operate at a distance of 10 m are suitable. It is important to note that this distance is maximal, since with a longer distance the point / line will become blurry or completely invisible. 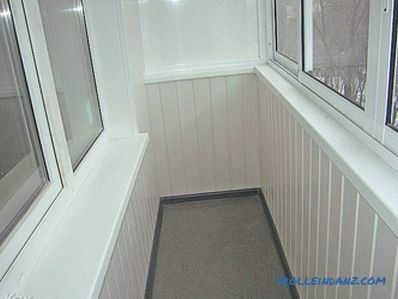 Therefore, it is better to stop the choice on devices, the range of the beam which is at least 20 m. Even when working in small rooms, its beam will be better visible, as it is brighter. Is this a lot or a little - 20 m? Imagine that the device is installed in the center of the room, and in each direction there is a 20 m stock. For domestic needs, this is more than enough. For professionals working at industrial facilities, it is best to pay attention to devices with the prefix in the name "Professional", since it is in this line that almost all queries regarding the range of the device are taken into account. The longer the range of the device, the brighter the beam will be, so you can focus on data within 300 m.
A very important indicator is the accuracy of devices, which is expressed in projection error.Only branded products will be acceptable. Having acquired the laser level of an unknown manufacturer, one cannot hope for its high accuracy - the error can be very large. For comparison, we can say that an error of 0.5–1 mm is considered normal, but for domestic use 3 mm is allowed. Rotary builders are more accurate. When choosing a suitable device, it is important to think about the method of its fastening. If he will stand on the floor, will there be enough of such a position for work or will you have to make a bricks stand? If necessary, you can take care of the purchase of a suitable tripod in advance. By using a tripod, the instrument will be at the correct height. To set the horizon, it is enough to adjust the length of the legs of the tripod. Pay attention to the features of the instrument alignment system. A device with manual adjustment will be cheaper, but if you often need to change its position, you will have to constantly adjust it. The system of self-leveling will relieve from such troubles. The principle of its work has already been described in the article. As mentioned in the article, laser levels are able to project a certain number of rays in different directions. For example, the simplest devices can display one or two lines. Most often this is quite enough when assembling furniture, doing decorating, or if you need to hang a shelf or a picture on the wall. Choosing a model with cross-beams, you need to pay attention to whether it is possible to use the beams both individually and together. 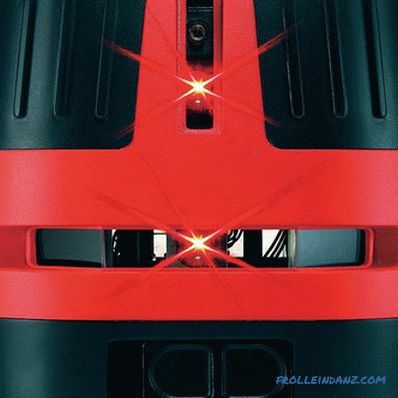 This option will help save power supply and reduce the likelihood of accidental contact with the eyes of a concentrated laser beam, when you do not expect it at all. As for the main directions of the rays, this is the horizontal and vertical. Additional directions include right and left, as well as points: zenith, nadir, plumb. Such a number of rays is necessary when performing marking on a large object or when several people work with this device at once. So, one worker can drill a hole in the wall, another - in the ceiling. When buying a device, it would be nice to pay attention to its complete set, which is described in the passport of the product. Most often it is a set of batteries, case and instruction, but this is not always. It often happens that the case has to be bought separately. Some manufacturers are not limited to the standard set and may add special glasses and a target to the kit, which will allow you to see the beam more clearly, especially in bright light conditions. Included with some models are radiation receivers, but this is provided mainly for professional devices. In the branded store you can ask for help from competent consultants who will help you choose exactly what you need. In addition, you will receive documents confirming your right to return the goods and warranty service. By purchasing the device on the market, you can get a few days to check and a maximum check drawn by hand, which has no legal force. immediately refuse to consider cheaper levels. Get exactly what you need for your work. Household laser levels are within 3-7 thousand rubles, but prices for semi-professional devices are several times higher, and are already in the range of 16-30 thousand rubles. Such equipment, as a rule, is good, accurate, reliable and multifunctional, but there is no reason to take it for everyday needs. 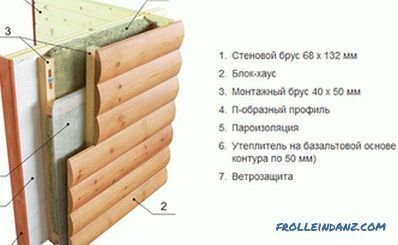 A segment of models priced from 5 to 7 thousand rubles will be suitable for almost all tasks at the household level. A feature of this device is the presence of a prism capable of building a horizontal plane at 360 ° and a vertical of 120 °. 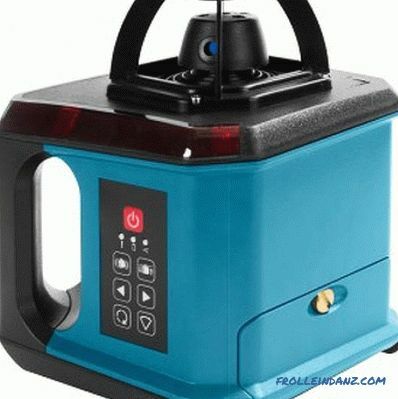 With high leveling accuracy of ± 0.5 mm / m, the range is only 10 m.
This device has the function of automatic alignment and simultaneously builds 3 rotational planes with a radius of 360 ° . The leveling accuracy in all planes is 0.2 mm / m, with a range of up to 20 m (or 80 m with a receiver). This is a very simple and compact device that can simultaneously form a horizon and a vertical at a right angle.The sweep angle is 120 °, the accuracy is within ± 0.5 mm / m, and the range is up to 10 m. It is successfully used for household needs. The device can be operated at minus ambient temperature (-10 ° C). Included is a case and a target. The measurement range is 15 m, and the receiver is up to 30 m with an accuracy of 0.3 mm / m.
This model is equipped with a transformable stand-stand that acts as an adapter for a standard stand. This device is suitable for both industrial and professional use. The working range is 20 m with a permissible error of 0.2 mm / m. Included with the receiver, the range increases to 40 m.
The table shows the approximate cost of a particular model only for comparative analysis, excluding promotional discounts or additional markups. The exact price needs to be found on the manufacturer’s website or from the organization selling the device. 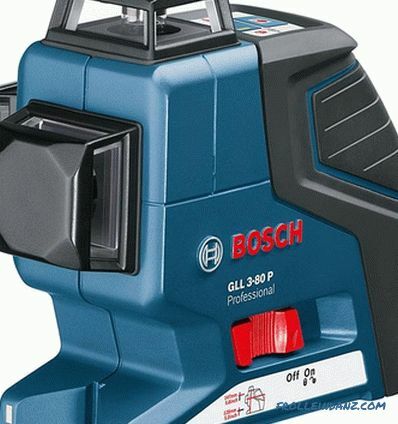 Be very responsive to the choice of laser level.